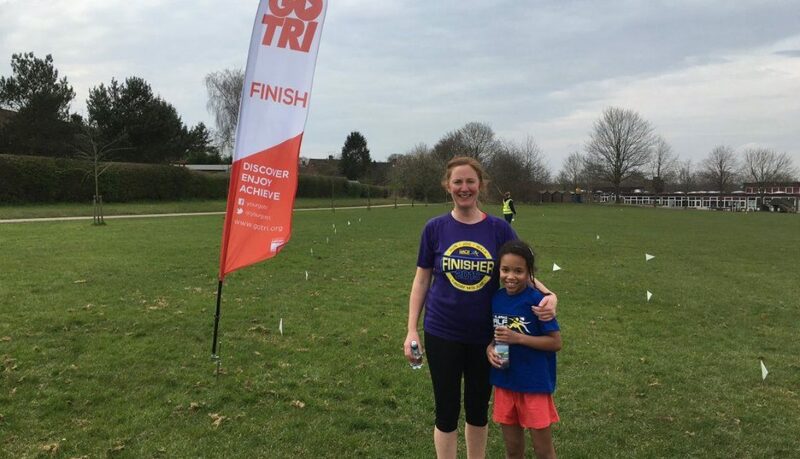 After organising a series of very popular GoTri events for beginners last year – before we were Aloha Tri – we are bringing them back to St Albans and surrounding cities. This first one is a GoTri Aquathlon on the back of the ATW Aquathlon at Stanborough Lakes, Welwyn, with a short open water swim and run. GoTri events are for beginners from 8+ to adult who would like to try a multi-sport event for the first time. It’s a no pressure and non-competitive aquathlon! 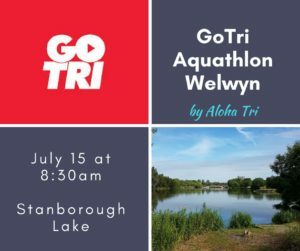 This is a special GoTri Aquathlon, as the swim is a lake swim in Stanborough Lakes. Watch out for more dates soon! Make sure that you have given yourself enough time to get to registration when arriving at the event location. There is no need to add that extra stress and burn calories frantically looking for the registration tent 30 minutes before the swim start. Taking a step back further, during the night before, have a read through your athlete’s guide so that you know where everything is situated so that you can comfortably arrive the following morning armed with all you need to know about your event. Plan to arrive early at Transition to have enough time to set up your area and to make any finally checks on your gear, nutrition and tyres. Rack your bike and make certain that your equipment is properly stowed in your transition bags or laid out in your designated transition spot. 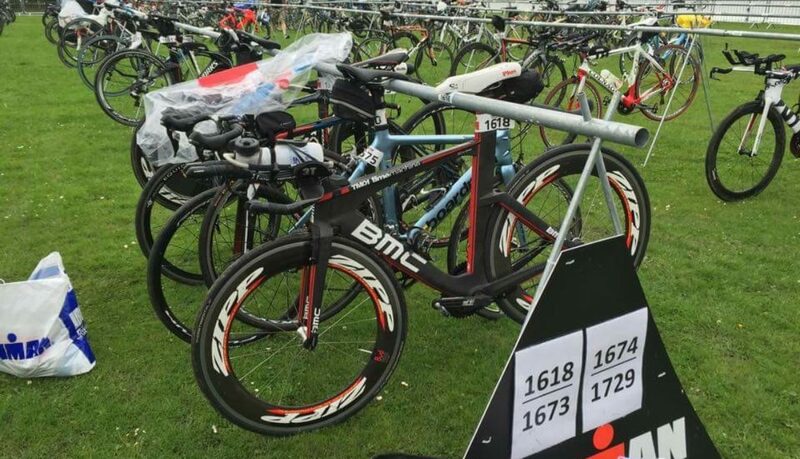 Make sure that you have properly sited where your bike is in respect of the rest of the Transition area, the swim entry point, bike exit and entry as well as the run exit all mapped out in your head. Following the body marking and street clothes drop off, do one last visual check of the swim course as you are waiting for your wave start time. If it’s possible, do a dry land warm up by jogging and loosening up your shoulders and if it’s allowed to do a short high intensity water warm up by swimming a few 100m efforts. Position yourself according to ability at the swim start. Start your swim and get some clear water by taking the first 300m at Zone 3 and settle in behind an equivalent athlete’s toes or shoulder and draft at an even Zone 2. Prior to exiting the swim, start kicking more than your standard two beat kick to get some blood flowing in your legs and swim to shore to avoid the heart rate spike and consequent shock to your system. When you exit the swim, do not first remove your swim hat and goggles from your head, but first unzip your wetsuit with both of your free hands and head to Transition. Mount the bike at the appropriate point at the bike mount line and start out on the bike at a steady pace at Z2-3 for the first few kilometres and do not go beyond Zone 4 threshold. You have successfully left T1! Enjoy the rest of your event! If you have any questions, drop me an email at rav@alohatri.com. If you would like to discuss YOUR next race, book a FREE initial consultation. Over the past weekend there have been a great deal of events completed by both Aloha Tri athletes and others. I can imagine that many of you either feel energised or completely wiped out (or both)! This is normal for everyone and the key is being able to take time out to have allow your mind and body to rest. 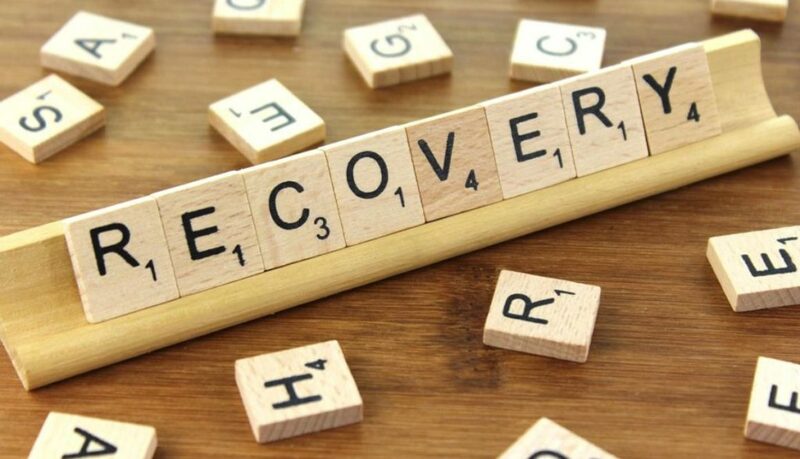 Post-Event recovery is essential to any quality training programme and should be included in “the plan.” As with tapering for an event, post-event recovery can be a traumatic process for athletes. Questions and negative thoughts arise such as “Am I doing enough?” “Will I lose my fitness if I stop?” “I’m racing next week, so I might as well plow on.” This is something that a lot of us go through and can lead to the eventual detriment of future athletic performance. Why should you take time to recover? Triathlon is a very physically demanding sport and requires a great deal of effort when racing. After completing an event, the consequences of returning to your high intensity endurance programme should not be ignored. The fact that your body has suffered through such stresses is sometimes not truly felt until days after completing an event. This is the well known delayed onset muscle soreness otherwise known as DOMS. The experience of DOMS can occur simply when getting up in the morning or when returning to your normally planned workouts swimming, cycling or running. This pain that you’re feeling is your body healing and it’s something that it’s trying to tell you. Starting back too early can exacerbate any damage that has occurred and can lead to injury. The process of post-event recovery has a psychological aspect as well. Competing in an event takes a lot of physical effort, but it also takes mental strength to see yourself across the finish line. Further, with the build-up prior to your race, the planning, tactics, and even simple things such as what you’re going to eat the night before, can weigh you down heavily. Frankly, it can be exhausting to consider all the things that one has to do even to start an event. Then when you’ve finally finished that race, you might go through a whole spectrum of emotions such as loss of motivation, self doubt, or even kicking yourself for not going under a certain time. These feelings are perfectly normal following an event, especially after exerting yourself for a period of time. How long should you recover for? That depends on a number of factors. Some professional athletes seem to bounce back and are able to race week after week without seeming to take a day off. This could lead to overuse injuries and eventual bench time, so emulating your favourite pro triathlete is probably not such a good idea to begin with. A good rule of thumb for recovery is based upon the duration of an event as well as the intensity of such activities. A sprint distance triathlon may only require a few days recovery, while recovery after a full Ironman distance triathlon would require at least 2 weeks or more before returning to a structured programme. If you’re a well-trained athlete with years of experience, you may not require as much recovery time as someone who is new to the sport. However, if you raced the event and put an all out effort, you may need more recovery time than you think. So even you life-long athletes need to listen to your bodies. What should you do during recovery? Once you’ve had a day or more off from training, athletes should continue their process of physical recovery. When we talk about recovery, we do not really mean that you lay around all day on “the couch of doom” doing nothing. Active Recovery is something that is encouraged to help the post-event healing process and to prepare you for your return to your training regimen. By doing some light exercise, going for a leisurely walk, bike or swim with friends or family can aid in doing this. You can even try that class at the gym that you’ve always want to do, but never had the time. Recovery is an important aspect of your training cycle and one that should not be ignored. If your coach has included regular rest and recovery days, do them as you would with any of your workouts. If you do so, it will make you a happy and healthy athlete! Get in touch with aloha@alohatri.com or check out our website http://alohatri.com for a free consultation with our head coach. The original Ironman swim course! Aloha from Oahu! What’s a 2.4 mile swim? It’s hard to put into perspective. Here’s a rough shot of the swim from the original IM course in Waikiki. Imagine swimming from the hotel on the left (San Souci Beach) to the cluster of hotels (in center frame on the right). And that’s just the beginning!